"To grow Oak on a 70-75 year rotation to produce 3.4m veneer quality butts"
Round Wood on the Froyle Estate near Alton (Hants) covers a mere five acres. With clay, flint and loam over chalk the 168m high site offers an attractive skyline feature easily visible above the busy A31. Walter Start has managed Froyle’s total of 600 acres of woodlands since 1953. His management objective is simple: "to grow oak on a 70-75 year rotation to produce 3.4 metre veneer quality butts." With six competition wins under his belt in 15 years, plus a successful sales record, the wood shows how a small woodland, if managed, can produce a profitable timber crop, be visually attractive and environmentally friendly. When he arrived on the estate Walter was confronted by a neglected former coppice-with-oak standards woodland. 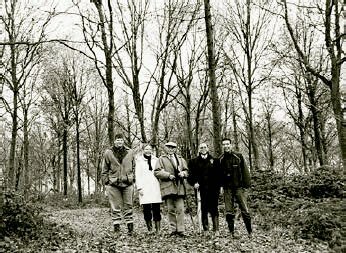 Following hand-weeding during 1957-62 and cleaning five years later, Round Wood’s first thinning and high-pruning operation took place in 1970. Pruning in subsequent years (with final crop selection in 1983) led to the 8th and penultimate thinning operation in 1994. The final thinning was delayed until 2001, finally winning The Mallinson Trophy at the Royal Show in 2002. The rest of the oak crop would now grow to maturity, leaving only 5% of the larch introduced as its nurse. The violent storms of October 1987 and January 1990 disrupted thinning schedules and so Walter undertook only light thinning and wind-blow clearance for a time. Today on entering the plantation the visitor is instantly impressed by the quality of the oak stretching straight, symmetrical and high pruned up into the sky, topped by well-formed crowns. Round Wood, in size and position, is similar to thousands of small lowland woods. It has already made a good income from recent thinnings and the final crop should provide a major boost to estate finances. It is a fine example of what can be achieved by farmers and landowners of small woodlands. "You do not have to have 100 acres: you can achieve a viable operation with five", says Walter. And he should know! Walter stands with his son and grandchildren - 3 generations together.